Total Recall Corporation is a Convergint Technologies company that specializes in providing a video-centric security technology. With its latest portable public safety video system, CrimeEye-RD-2 quickly streams HD-quality live video to a laptop or tablet. Total Recall uses bigDAWGS’ Musical Brochure as an invitation to the International Association of Chiefs of Police Expo (IACP) 2017. 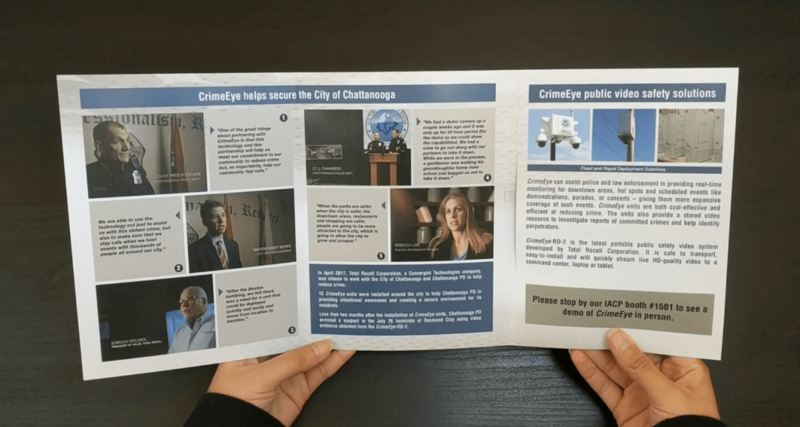 They will be showcasing the “CrimeEye” public video safety solution during the event. Stop by Booth #1501 to see a demo in person!